Ensure your workplace has an up to date fire policy. Examples can be found here. Make sure all your staff know what the policy says and understand the role they all individually have to play in keeping your workplace safe. 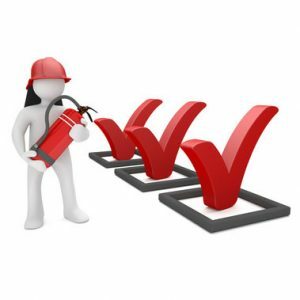 Regularly complete and update a fire risk assessment of the premises. Guidance can be found here. We recommend you schedule this is once a year and don’t forget to include remote buildings/spaces. Ensure the workplace is clear of waste and debris, things like shredding and discarded fabric can rapidly go up in flames! This is also good opportunity to go paperless and tackle the mountain of archived paper files you have. Keep and maintain sufficient firefighting equipment for the office and the type of work you are carrying out… and get it serviced in line with recommendations. If appropriate and relevant, hold regular drills in line with your fire policy, remembering to include all those who have physical challenges so they are familiar with what will happen in the event of lifts etc being shut down. Block fire exits or allow anyone else to do this – not even for ten minutes! It is your legal responsibility to keep them clear as well as being a sensible way to reduce the risk to yourself, your staff and your visitors in the event of a fire. Fire exits should NEVER be padlocked or locked in such a way that they cannot easily be opened from the inside. Store flammable materials anywhere near an ignition source or an oxidiser and clear up immediately any spilt fuel or other combustible. Keep sand buckets near any fuel storage areas to deal with such spillages. Assume that the worst will never happen. Plan for disaster and create a Personal Emergency Evacuation Plan (PEEP) for yourself and your staff. PEEP documents can be found here. Forget to regularly test fire alarms, you don’t need to have a whole fire drill to do so! Consider whether you need visual as well as audio alarms if you have hearing impaired employees. Allow electrical equipment to go untested. Everything should be PAT tested in accordance with regulations. 10.5 Most of fire safety is common sense but what often goes wrong is people being lazy, not following the fire procedures, and generally being unprepared in the event that a fire does occur. One bit of research suggested that 70% of businesses experiencing a major fire do not reopen after the fire or subsequently fail within 3 years. Don’t let this be your business simply because you didn’t take fire risks seriously.